Boom lifts are very convenient and useful on construction job sites, but they can cause serious injuries if safety measures aren’t taken. Here are a few safety tips for using boom lifts that can help keep you safe from preventable injuries. Hiring employees who are trained to work boom lifts and know how to follow safety procedures can help keep yourself and your other employees safe while the boom lift is in use. You can have them show you how they would operate a boom lift before they go out and do it on an actual job, and this can help you find any potential problems and fix them before any accidents can happen on the job. Always make sure that you wear the harness and secure the lanyard to the bucket. It may seem unlikely that you’ll fall out of the platform but any bump from another piece of equipment or anything else can get you off-balance and put you at risk of falling. Even a strong gust of wind could knock you down or off of the platform, which could seriously hurt you or even kill you. Wearing your harness and making sure the lanyard is secured to the bucket will lessen the risk of injury while you’re in the platform. Although this is very rare, it is also possible for boom lifts to tip over – keeping the area under and around the boom lift clear will help make sure that no one is hurt if the entire thing tips over. Each boom lift has a specific weight capacity. Make sure you never go over this limit, because doing so could make the lift top-heavy and cause it to tip over. You should always account for the weight of the worker, tools, and materials in the platform and make sure the combined weight isn’t more than the recommended capacity before operating the lift. Remember not to use the lift for lifting heavy supplies. When you’re in the platform of a boom lift, it may seem easy to climb on the edge of the platform to reach something instead of moving the entire boom lift to reach it. But don’t ever do this! Climbing or sitting on the edge of the platform increases your chances of falling off the platform a lot, and this can result in serious injury or even death. If there is something that you can’t reach, communicate with the boom lift operator to help get you to a safe position in the platform where you can reach what you need. When a boom lift is extended really high, the wind can become a huge problem. If the wind is strong enough, it can knock a boom lift over completely. You should avoid using boom lifts on extremely windy days to avoid boom lifts falling over. Each lift has a limit of how much wind it can withstand, so check the user manual to know how much wind your specific boom lift can handle. A boom lift can extend very high, and as you’ve seen previously, this can increase the chances of it tipping over for many reasons. Another thing you can do to prevent this tipping from happening is making sure you are operating the boom lift on even ground. Having the base stabilized will help everyone around stay safe. If your operating space doesn’t offer much stable ground, make sure you are using the brakes correctly to stabilize the base. Always look at the manufacturer’s manual to know how to move the boom lift. The manual will tell you if it’s safe to move the lift while it is extended, although you should avoid moving the lift while it’s extended even if the manual says it’s safe. Moving it while it’s extended creates a lot of opportunities for injury and should only be done when it’s necessary and only if the manual condones it. Otherwise, you should lower the boom lift completely, move it, and then extend it to where you need it. 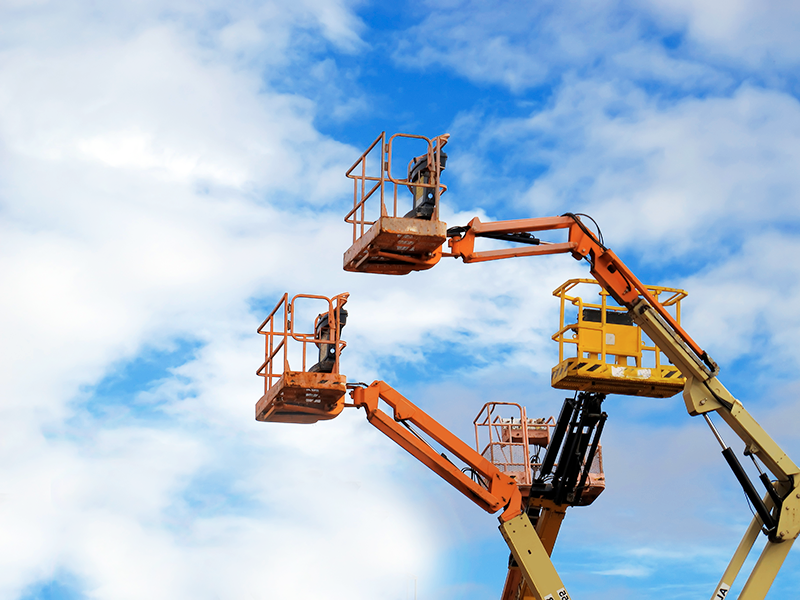 Operating boom lifts can be tricky, but if you follow these safety tips you can avoid accidents and keep everyone involved safe.